We're a sweet-toothed nation, eating far too much sugar for our own good. A sugary diet can lead to weight gain and health problems such as type-2 diabetes, so none of us should be having more than the maximum seven teaspoons of sugar a day. 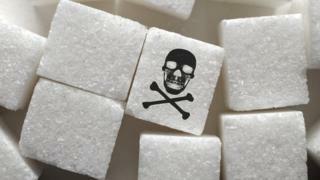 Public Health England wants our sugar intake from a host of popular foods to be cut by a fifth by 2020. Part of the solution includes reformulating foods with sugar replacements. Artificial sweeteners give a sweet taste with few or no calories. There are lots of different types in thousands of different products, including diet foods and drinks. They all aim to do the same job of delivering sweetness in the place of sugar, meaning fewer calories. Some, such as saccharin, sucralose, acesulfame K and aspartame, are intensely sweet in tiny doses, making them ideal for using in low-calorie soft drinks and sugar-free gum. Others, such as sorbitol and xylitol, are more bulky, like real sugar, so are useful as a replacement in products such as confectionery. Ask an expert and, frustratingly, most will say it should be down to "personal choice". Limiting how much sugar you eat is definitely a good thing - helping reduce your risk of diabetes, obesity and tooth decay. When you consider that a regular can of cola contains nine cubes of sugar, having a diet version instead could make a difference. Whether swapping sugar for a sweetener is truly healthy is harder to answer. Certainly, eating low-sugar, low-calorie products is no guarantee that you will stay fit and slim. They are not a replacement for a healthy diet. If they are artificial, doesn't that make them unhealthy? Many are synthetic, but some sweeteners may be made from naturally occurring substances. Stevia-based sweeteners are made from the leaves of a plant. Also, synthetic does not mean unhealthy. By law, food or drink products must be clearly labelled and list on the packaging whether they contain low-calorie sweeteners, allowing consumers to make choices when they buy. Will switching to sweeteners make me lose weight? Reducing the calories you get from sugar can help with weight loss. How much weight you will lose, however, depends on your overall diet and how much exercise you are getting, as well as your genetic make-up and metabolism. Dr Stacey Lockyer, from the British Nutrition Foundation, says switching to artificially sweetened, low-sugar foods and drinks might help some dieters. "There are studies showing both in the short and long term that people who consume low-calorie versions in their diets take in fewer calories and do tend to lose weight. "If you take drinks, for example, plain water is best - but some people might find it hard to switch from sugary drinks to water. "They might want to consider having a diet or low-calorie drink if they like the taste." Artificial sweeteners are closely regulated and have passed the necessary checks to be used in foods. The European Food Safety Authority sets an acceptable daily intake, which is the maximum amount considered safe to consume each day over the course of your lifetime. And these limits are hard to bust. Using the sweetener aspartame as an example, an "average" adult (weighing 70kg; 11 stone) could drink up to 14 cans of a sugar-free fizzy drink or use 40 teaspoons of the sweetener in their tea or coffee each day without exceeding the limit. For a child (weighing 23kg), the equivalent maximum is four cans of drink and 13 teaspoons of sweetener. There has been lots of negative press about artificial sweeteners. Some studies have claimed they might make people more hungry and upset blood-sugar levels, but there is no convincing evidence of harm. Some are concerned that sweeteners may alter our taste for foods so that we start to find naturally sweet foods, such as fruit, less appealing and crave more sugary foods. There are some people who cannot or should not consume artificial sweeteners, however. Children up to the age of three should not have them, but pregnant women can. People born with a rare genetic condition called phenlyketonuria should avoid aspartame because it can be harmful to them. For the rest of us, it is worth noting that consuming lots of them may cause flatulence and diarrhoea. Sugar is a type of carbohydrate and because all carbohydrates affect blood-glucose levels, reducing your sugar intake can help to keep blood glucose levels under control. Diabetes UK says: "As sugar contributes no nutritive value, apart from carbohydrates and calories, it has 'empty calories' and so is not good if you're looking to manage your weight. "This doesn't mean that people with diabetes should have an entirely sugar-free diet."